Please send feedback on this guide here. Pro-reform candidates are in green; Anti-reform in red; Neutral in black. Californians will have the opportunity to vote on an initiative to legalize adult use of marijuana this November 8th with Propostion 64, the Adult Use of Marijuana Act (AUMA). Although Prop. 64 has its drawbacks and is not all it should be from a consumer perspective, on balance it offers signficant improvements over California's current laws and would be a major boost to cannabis reform nationwide. Like comparable initiatives in Colorado and other states, Prop. 64 legalizes the possession and use of one ounce or less of marijuana by adults 21 and over. In addition, it allows adults to cultivate up to six plants for personal use in a private, enclosed space. This limit doesn't apply to medical users, who may still grow and possess as much as required for personal medical use under Prop. 215, though this is subject to limitation by local nuisance ordinances. In addition, Prop. 64 forbids local governments from completely banning personal use indoor cultivation, something that courts have allowed them to do under current law. Importantly, Prop. 64 reduces the penalties for cultivation, sale, transport, and possession with intent to sell from mandatory felonies to misdemeanors, eliminating the number one cause of felony pot arrests in California. Although felony enhancements are still allowed for third-time offenses and violent or aggravating circumstances, in no case does Prop 64 increase existing criminal penalties. It also completely eliminates jail or prison sentences for minors under 18. Importantly, Prop 64 allows prior offenders, prisoners and parolees to petition the court for automatic dismissal of charges or resentencing. Contrary to rumor, Prop. 64 would in no way override, repeal, or detract from the existing Prop. 215 rights of qualified patients to possess and cultivate for personal use, nor would it change how doctors recommend it. However, it should be noted that Prop. 215 does NOT protect the right to smoke or consume in public, nor does it protect rights to employment, housing, or freedom from discrimination, nor does it require local governments to allow delivery or sales of medicine - unfortunately, neither does Prop. 64 do so. However, Prop 64 does include a provision protecting medical users from CPS (Child Protective Services) charges. On the minus side, users should beware that Prop 64 establishes a new $100 fine for consuming marijuana in any "public place" - even tobacco smoking areas, so it will not longer be legal for Prop 215 patients to smoke their medicine in the streets. Furthermore, Prop 64 prohibits the use or possession of an "open container" of marijuana in motor vehciles, even by back-seat passengers. Inexcusably, Prop. 64 also prohibits vaporization in all non-smoking areas, despite compelling evidence that second-hand cannabis vapor poses no public health hazard. Fortunately, though, unlike similar legalization initiatives in Colorado and elsewhere, Prop. 64 does allow for on-site consumption in specifically licensed establishments. Prop. 64 would regulate the manufacture, cultivation, distribution and sale of cannabis along similar lines as the state's new Medical Cannabis Regulation and Safety Act (MCRSA). Small growers and collectives have voiced understandable concerns that this will encourage large corporate grows to take over the market. One of the more controversial provisions in Prop 64 would allow licensed cultivation areas larger than MCRSA's current limit of one acre outdoors or 1/2 acre indoors beginning in 2023. However, Prop 64 would eliminate MCRSA's unpopular requirement for independent distributors, require licensees to be California residents through 2019, and eliminate MCRSA's ban on licensing of persons with prior marijuana and drug felonies. While patient advocates remain concerned that non-profit collectives will no longer be protected by SB 420 after state licensing takes effect, this is a result of MCRSA, not Prop. 64. The trend towards greater involvement by big business is an inevitable result of the state's commitment to mandatory licensing under MCRSA and will no doubt persist regardless of Prop 64. A serious concern about Prop 64 is that it would impose substantial new taxes on marijuana. These include a $9.25 per ounce wholesale cultivation tax (about 10% of current prices) and a hefty 15% retail excise tax, plus the existing 7.5+% sales tax. In addition, local governments could still impose unlimited taxes of their own, some of which already range as high as 10%. An obvious concern is that overly high taxes will encourage unlicensed black market providers to undercut the legal market. Although Prop 64 exempts medical users who obtain a voluntary state ID card from the 7.5% sales tax, they would still face a net 17.5% tax increase under AUMA, posing undue financial burdens on needy patients. In the longer term, though, the cost of marijuana is certain to decline substantially under legalization, with prices 50%-75% below current levels entirely realistic according to industry experts. Tax revenues from Prop. 64 are expected to amount to some $1 billion annually and would be allocated to drug abuse education. treatment and prevention programs, environmental restoration, research, and grants to local governments and law enforcement in jurisdictions that choose to permit marijuana sales. Prop. 64 enjoys a comfortable lead in the polls (60%-36% according to PPIC in mid-September). Proponents enjoy a big advantage in fundraising, having raised over $12 million from major donors led by internet billionaire Sean Parker along with Weedmaps, New Approach PAC, Drug Policy Action and others. Prop. 64 also has an impressive list of endorsements, including Lt Gov. Gavin Newsom, the LA Times, San Francisco Chronicle, the California Democratic Party, the California Medical Association, NAACP, and all major national drug reform organizations. The major opposition comes from the usual gaggle of prohibitionists led by SAM (Smart Approaches to Marijuana), Sen. Dianne Feinstein, and law enforcement groups with a vested interested in prohibition. Opponents' leading objection to Prop 64 is that it doesn't create a new legal standard for marijuana DUI like the .08% blood limit for alcohol, but instead keeps California's current drug DUI laws in place. They ignore the fact that per se DUI standards have proven to be scientifically impossible for cannabis, that they don't exist for other legal drugs such as prescription opiates or tranquilizers, and that cannabis is nowhere near as dangerous a driving hazard as alcohol. In any case, Prop 64 helpfully allocates over $10 million for research and detection of impaired driving. A different line of opposition to Prop. 64 comes from a vocal minority of cannabis devotees, libertarian purists, backyard growers and patient advocates who dislike the initiative's innumerable regulations and prefer a more open-ended apporach such as the "tomato model" with unlimited personal use growing. However attractive such visions may be, they are not politically feasible in a state where 85% of the voters are non-consumers. Prop 64 isn't the final word in marijuana or drug reform; many further improvements will be called for. Fortunately, most provisions in Prop. 64 can be modified by a simple majority of the legislature. Observers agree that a victory for legalization in California would be a powerful boost for marijuana reform both nationally and internationally. On the other hand, defeat would undoubtedly be interpreted as a major setback to legalization and likely invite a crackdown. If Prop. 64 passes, it will take effect at midnight Election Night. At that point, Californians over age 21will be free to possess, grow and use marijuana in private. Adult use sales won't begin until Jan 1, 2018, and only then in localities that permit them. In the meantime, marijuana will be available for sale only to qualified Prop 215 patients via medical dispensaries. Feel free to light up in celebration if Prop. 64 passes - just remember not to do so in public. Cal NORML Guide to Prop 64. This measure would increase the cigarette tax by $2 a pack from $0.87 to $2.87, with an equivalent tax on other tobacco products. The lion's share of the revenues would go to Medi-Cal, prompting opponents to object that they should go to anti-smoking programs instead - a disingenuous complaint given that the No on 56 campaign is financed by tobacco companies. A more honest criticism of Prop 56 is that it taxes smokeless e-cigarettes the same as tobacco cigarettes, as if they posed similar health hazards. In fact, e-cigarettes are vastly safer than conventional cigarettes because they eliminate harmful smoke toxins that cause cancer and lung disease. Unlike smoked tobacco, e-cigarettes also pose negligible health risks from second-hand exposure. A report by Public Health England estimates that e-cigarettes are 95% less harmful than smoking. Many ex-smokers attest that e-cigs have helped them finally clear theur lungs of the smoking habit, and British authorities are actively promoting them as a valuable harm-reduction technology. Unfortunately, the proponents of Prop 56, led by environmentalist Tom Steyer, have swallowed the propaganda of California's powerful anti-smoking lobby, which has received millions of dollars in federal funding for a public health disinformation campaign to convince the public that e-cigs are as dangerous as smoking. As pointed out in the ballot pamphlet, there's evident concern that the ongoing decline in cigarette use - which is partly fueled by e-cigs - has been adversely affecting anti-tobacco tax revenues. Fortunately, Prop. 56 does not include cannabis or other non-nicotine e-cigs in the new tax, but the question must be asked why proponents have chosen to tax a helpful harm reduction substitute for smoking. PROP. 57 - CRIMINAL SENTENCES - PAROLE. This initiative, sponsored by Gov. Brown, would increase parole opportunities for non-violent offenders, thereby saving the state millions in taxpayer dollars while keeping the most dangerous criminals safe behind bars. It's a rare day when Gov. Brown adovcates a criminal justice reform measure; the opponents are the usual gaggle of cops and DAs with a professional interest in locking people up. Democrat Hillary Clinton has stated that since marijuana’s current scheduling status has impeded research, she will call for its removal from Schedule One if elected. Small though this step might seem, it represents a fundamental break from a misbegotten federal policy that reformers have been seeking to overturn for over forty years. Importantly, Clinton has also stated that the federal government shouldn’t interfere with state legalization laws like Colorado’s. She has also expressed concern about mass criminalization and incarceration of minorities caused by the war on drugs. Hillary has habitually taken different positions over the years, letting her position evolve with public opinion. According to Wikileaks, she privately told the CEO of Xerox she was against legalizing marijuana back in March, 2014. More recently, sources who have spoken to Hillary say she fully understands the need for comprehensive reform. Hillary's running mate, Virginia Sen. Tim Kaine, has a mediocre C+ rating from NORML's Congressional scorecard, saying he would support "drastic changes" in sentencing law but wouldn't vote to decriminalize marijuana. However, he's also stated he would respect states' rights on legalization measures. On the Republican side, it’s hard to know what to make of Donald Trump, whose pronouncements routinely flip all over the map. To his credit, though, Trump has strongly endorsed medical marijuana, saying he knows people who have benefitted “tremendously” from it. As for full legalization, while Trump says he’s concerned about “problems” in Colorado, he has repeatedly said that the marijuana issue should be left to the states. Fortunately, this position is supported by a growing number of Republican Congress members, led by CA Rep. Dana Rohrabacher, who have voted to cut off funding for federal interference in state medical marijuana laws. On the other hand, Trump's embrace of stop-and frisk police searches is hardly comforting. Furthermore, Trump's running mate, Indiana Gov. Mike Pence, is an old-fashioned social conservative and stolid opponent of drug law reform, saying "I think we need to focus on reducing crime, not reducing penalties." Voters who are understandably dissatisfied with the major party choices have two good alternatives in the Libertarian candidate, former New Mexico Gov. Gary Johnson, and the Green party candidate, Dr. Jill Stein, both of whom forthrightly advocate full legalization of marijuana. Two Democrats are vying for the seat of retiring Sen. Boxer. Rep. Loretta Sanchez of Orange County has been a staunch supporter of medical marijuana over the years. Since joining the House in 1997, she has compiled a near perfect voting record on marijuana and drug reform issues, the longest such record of any Southern California Democrat. She is also familiar with the medical marijuana industry, her district including a leading center of legal access in Orange County, Santa Ana. At times, Sanchez has a weakness for going over the top. Asked in a debate about what the she would do in Washington to reduce crime in California, she replied, “First of all, I believe that we need to get the federal government to get marijuana off of schedule one.” When interest in legalization first heated up in California a few years ago, she suggested that the state explore a pilot program of legalized, regulated marijuana, but discreetly retreated after getting zero support from her colleagues. Attorney General Kamala Harris is staunchly progressive, but cautious when it comes to marijuana. As A.G., she did disappointingly little to support Prop. 215, rebuffing requests to join other states in filing a rescheduling petition with the federal government. More seriously, Harris failed to speak up against the federal crackdown on dispensaries in California, despite the fact that as former District Attorney of San Francisco she should have known that the city’s dispensaries were working well and the federal charges against them were bogus. Running for re-election, Harris waved off a question about legalization with a laugh, but later said she is “not opposed” to it and even sees it as “inevitable.” Speaking at the Democratic convention, Harris called the war on drugs “a failure” and called for ending the federal ban on medical marijuana. Most likely Harris would vote well enough in the Senate, but her lack of leadership in the state has been troubling. Support for marijuana reform has been strengthening in the U.S. Congress, where a majority of members has voted to approve budget amendments by Rep. Dana Rohrabacher (R-Huntington Beach) and Rep. Sam Farr (D-Monterey) blocking the Department of Justice from spending funds to interfere with state medical marijuana laws. Congress also narrowly voted down an even stronger budget amendment by Rep. Tom McClintock (R-Roseville) and Jared Polis (D-CO) protecting states with adult use legalization as well as one by Rep. Earl Blumenauer (D-OR) protecting veterans' access to medical marijuana. However, the conservative Republican leadership has successfully blocked committee hearings on stronger measures that would actually change federal laws so as to legalize medical and non-medical use of marijuana. Barring an unlikely change of heart by Republican House Speaker Paul Ryan (WI), the only chance for stronger reform legislation would be the election of a Demoratic majority under the leadership of Nancy Pelosi (D-S.F. 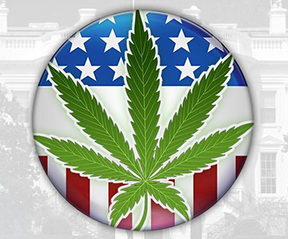 ), who has said marijuana reform should be an important Congressional priority. However, a Democratic takeover of Congress remains a long shot this election cycle. In general, California's Congressional delegation has voted well on marijuana reform, consistent with public sentiment in the state. Support has been strongest among Democrats, all but one of whom (Rep. Karen Bass - LA) supported the Rohrabacher-Farr amendment to protect Prop 215 from federal interference. Democrats Rep. Barbara Lee (Oakland), Eric Swalwell (Hayward),Ted Lieu (Malibu), Alan Lowenthal (Long Beach), Jared Huffman (Emerald Triangle), and retiring Rep. Sam Farr(Monterey) have been leading sponsors or co-sponsors of reform bills. Although most of the state's Republicans have followed the prohibitionist line touted by party leaders Rep. Kevin McCarthy (Bakersfield) and Darrell Issa (Vista), special credit goes to Dana Rohrabacher (Huntington Beach) and Tom McClintock (Roseville) for sponsoring important reform bills to protect state marijuana laws. The only other state Republican supporting them has been Rep. Duncan Hunter (San Diego). Key Congressional votes and ratings are recorded at national NORML's Congressional Scorecards. The following California Congress members running for re-election deserve special credit for endorsing Prop 64 or co-sponsoring federal pro-legalization bills. 1st Congressional District - Oroville/N.E. California - Longtime prohibitionist incumbent Doug La Malfa (R) says : "I think the further legalization of marijuana will be something that comes back to bite us in future years, and so any measure that would continue to keep it as a controlled substance I would support." LaMalfa went so far as to lobby Placer County officials against their measure to license commercial cannabis cultivation. His opponenent, Democrat Jim Reed, has said, "I lean libertarian. I support legalization notwithstanding the Federal position." 7th C.D.- Rancho Cordova/Roseville - In this closely contested district, incumbent Democrat Ami Bera has posted a decent "B" voting record and supports medical marijuana. Bera is opposed by former Sacramento County Sheriff Scott Jones (R), who is "100% against" legalization. 8th C.D. - Apple Valley/Yucaipa/Barstow - Incumbent Republican Paul Cook has consistently voted wrong; he is being challenged by Democrat Rita Ramirez, who is in favor of medical marijuana (but not full legalization). 9th C.D. - Stockton - Incumbent Democrat Jerry McNerney has a good voting record and has expressed compassion for medical marijuana patients. He is opposed by Antonio Amador, a retired U.S. Marshall. 10th C.D. - Modesto/Manteca - Incumbent Republican Jeff Denham is a social conservative with an atrocious voting record; his Democratic opponent, as in 2014, will be Michael Eggman, who "supports legalization in California, so long as it’s passed by the voters, the age of consent is 21, and, of course, it is still illegal to operate a vehicle while under the influence." 11th C.D. - Richmond/Concord/Walnut Creek/Pittsburg - Incumbent Mark DeSaulnier (D) has a good voting record in Congress. His opponent Roger Allen Petersen writes, "I have yet to be persuaded that there is any reason to amend Federal law regarding Marijuana." 12th C.D. - San Francisco - Democratic minority leader Nancy Pelosi is the most powerful supporter of medical marijuana in Congress. If Democrats were to regain the majority and re-elect her speaker, it would open the door for legislative action on reform bills that have been bottled up by the conservative Republican leadership. Her opponent, progressive Preston Picas, is in favor of full legalization of marijuana. 17th C.D. - San Jose / Santa Clara - Veteran incumbent Democrat Mike Honda has posted a strong pro-reform record in both Congress and the state legislature, co-sponsoring the States' Medical Marijuana Protection Act and the Ending Federal Marijuana Prohibition Act. Honda is facing a rematch against Democratic challenger Ro Khanna, a Silicon Valley entrepreneuer who hasn't publicly stated his position on drug issues, though sources who know him believe he would vote well. 20th C.D. - Monterey - Monterey County Deputy DA Jimmy Panetta (D), Leon Panetta's son, is almost sure to take this open seat, vacated by Sam Farr, co-author of the landmark Farr-Rohrabacher amendment protecting state medical marijuana laws. Panetta's opponent is Republican former Naval Officer Casey Lucius, whose "anti-cannabis agenda is out of touch with mainstream, bipartisan voters." It's been said Panetta needs to be educated about marijuana issues, but he's received donations from marijuana industry players. 21sh C.D. - Kings County - Incumbent Republican David Valadao has a poor voting record; his Democratic opponent is Emilio Huerta. 22nd C.D. - Squaw Valley/Visalia/Clovis - Incumbent Republican Devin Nunes has a poor voting record; his Democratic opponent is Louie Campos, who writes, "I am in favor of legalization for medical, industrial, and recreational use." 23rd C.D. - California City - Incumbent Republican Kevin McCarthy has posted a dismal voting record while serving in the powerful position of House Majority Leader. His Democratic opponent Wendy Reed, writes, "I am of the opinion that marijuana should not be illegal. I support legalization." 24th C.D. - Santa Barbara - Santa Barbara County Supervisor Salud Carbajal is in strong position to take Lois Capps's open seat in this district, running against Republican entrepreneur Justin Fareed. In January, Carbajal voted on to allow existing cultivation in Santa Barbara county, also expressed that he wanted to allow delivery. 25th C.D. - Palmdale/Santa Clarita - Incumbent Republican Steve Knight has a mediocre "C" voting record, but has acknowledged that marijuana has medical value and should be reclassifed to Schedule 3; his Democratic opponent Bryan Caforio says he is in favor of Prop 64. 29th C.D. - Sylmar - Incumbent Tony Cardenas has a solid "B" rating from NORML. His opponent, fellow Democrat Richard Alarcon also posted a good voting record while he was a State Senator. 31st C.D. - San Bernardino - Republican anti-drug activist Paul Chabot, the founder of Drug Free California, will again face Democrat Pete Aguilar, who was endorsed by local reform advocates when he first took the seat in 2014. Aguilar has since voted well in Congress and told NORML he believes marijuana policy is a states-rights issue. 32nd C.D. - West Covina - Incumbent Democrat Grace Napolitano has voted well in Congress; her fellow Democratic rival is Assemblyman Roger Hernandez, who has also voted well on marijuana reform measures. 37th District - West LA - Democratic incumbent Karen Bass posted a medicore C in NORML's ratings, having voted against the crucial Rohrabacher/Farr amendment to protect state medical marijuana laws. She ran very well against fellow Democratic challenger Chris Wiggins in the primary, taking 80% of the vote. 39th C.D. - Fullerton - Incumbent Republican Edward Royce has a poor NORML grade; he took 60% of the vote in the June primary against Democratic challenger Brett Murdock. 40th C.D. - East LA - Incumbent Lucille Roybal-Allard got a NORML "B-" rating for voting against McClintock/Polis, but otherwise she has voted well. She faces independent Roman Gabriel Gonzalez. 42nd C.D. - Menifee - Incumbent Republican Ken Calvert has a NORML "C" Rating. Although voting poorly in every other respect, he co-sponsored H.R. 1635, the Charlotte's Web Medical Access Act of 2015. This could be a fairly close race with Calvert taking 55% in the primary and his challenger Tim Sheridan 37%. 44th C.D. - Carson - This race has State Senator Isadore Hall (D) facing off against Hermosa Beach City Councilwoman Nanette Barragan (D) for Janice Hahn’s seat. Hall, who had a very good voting record in the legislature, took the primary with 40% vs. Barragan’s 22%. 45th C.D. - Irvine - Democrat Ron Varasteh faces an uphill battle in his bid to unseat Republican Mimi Walters, who has a NORML "D" rating in Congress and was on DPFCA's State Senate Hall of Shame. Varasteh writes, "I am in full support of legalizing marijuana." 46th C.D. - Orange County - In the race to fill Loretta Sanchez’ seat, Democrat Bao Nguyen, the gay Vietnamese-American mayor of Garden Grove, supports legalizing marijuana. His opponent is Democrat Lou Correa, who posted a terrible record and sponsored obnoxious anti-marijuana measures in the state legislature. 49th C.D. - Oceanside/Dana Point - Incumbent Republican Darrell Issa not only has a terrible voting record, he has expressed moral outrage at the idea of decriminalizing marijuana. His opponent Col. Douglas Appelgate is endorsed by Americans for Safe Access. 50th C.D. - San Diego - Incumbent Duncan D. Hutner is one of the few Republicans who has taken a strong stance for marijuana reform. He co-sponsored the "Respect State Marijuana Laws Act of 2015" the CARERS Act, and Charlotte's Web Medical Access Act. He is endorsed by San Diego Citizens for Patients Rights. 52nd C.D. - San Diego - Democratic incumbent Scott Peters has voted well , co-sponsoring H.R. 2076, the Marijuana Businesses Access to Banking Act of 2015, and has engaged with local medical marijuana advocates. His opponent Denise Gitsham is a former Bush aide. 53rd C.D. - San Diego - Incumbent Democrat Susan Davis has posted a consistently good voting record and is endorsed by San Diego Citizens for Patients Rights. AB 258 by Asm Marc Levine (D-San Rafael) prohibits hospitals from denying organ transplants to persons simply because they are medical marijuana patients. Signed by Gov. Brown in 2015. AB 730 by Asm. Bill Quirk (Hayward) tightened the definition of felony transportation of marijuana to require intent to sell. Signed by Gov. Brown in 2015. AB 821 by Asm Mike Gipson (Carson) eliminates penalties for cash tax payments by state licensed dispensaries, who are presently unable to pay by other means (Signed by Gov. Brown, 2016). Another Gipson bill, AB 567, which would have provided a tax penalty amnesty to applicants who pay their back taxes, was vetoed by Gov. Brown. MMRSA: The legislature broke a longstanding impasse last year by finally approving a bill to legally recognize and license the medical marijuana industry. The final act – a bundle of three bills (AB 266, AB 243 and SB 643) known as MMRSA (Medical Marijuana Regulation Safety Act) – was spearheaded by Asm. Rob Bonta (D-Oakland), along with Asm. Jim Wood (D-Healdsburg), Reggie Jones-Sawyer (D-L.A.), Ken Cooley (D-Rancho Cordova), Tom Lackey (R-Palmdale), and Sen. Mike McGuire (D-Healdsburg). MMRSA was by necessity a political compromise, involving agreement from law enforcement, local governments, and medical, industry and environmental groups, as well as patients advocates. While the final package was inevitably imperfect, California NORML was able to help improve the bill and joined a broad coalition of cannabis advocates in support of its passage. The pro-MMRSA coalition attracted moderate and conservative legislators who had previously been hostile to medical marijuana, including a record 14 out of 42 Republicans in the legislature. Only one Democrat – retiring Asm. Mike Gatto (LA) - voted against MMRSA and has been a consistent foe of other marijuana reform bills. Six other Republicans, Asm. Beth Gaines (Roseville), Franklin Bigelow (Angels Camp), Melissa Melendez (Murrietta), Sen. Joel Anderson (Temecula) and Shannon Grove (Bakerfield) also had a 0% voting record on marijuana issues. By contrast, 54 of the legislature’s 78 Democrats had a perfect voting record this session. 11- Mark Leno (SF - retiring). AD 14 - Concord / N. Contra Costa Co. - Concord council member Tim Grayson led the push to ban dispensaries in the city. He is opposed by fellow Democrat Mae Cendana Torlakson. AD 16 - Dublin / S. Contra Costa Co - Incumbent Republican Catherine Baker, who has a terrible voting record, faces a tough challenge from Democrat Cheryl Cook-Kallio, who has taken an active interest in cannabis issues. AD 35 - San Luis Obispo - Republican businessman Jordan Cunningham has been a strong opponent of medical marijuana. He is opposed by Democrat Dawn Ortiz-Legg. AD 36 - Lancaster/Palmdale: Incumbent Republican Tom Lackey faces opposition from ex-Asm. Steve Fox, who compiled one of the worst voting records of any Democrat in Sacramento on drug reform issues. Although Asm. Lackey opposes Prop 64, he deserves credit for working with Democrats to co-sponsor the Medical Marijuana Regulation and Safety Act. AD 76 - Oceanside: Incumbent Rocky Chavez (R) has a terrible voting record. His opponent, Thomas Krouse (R), supports medical marijuana and is endorsed by San Diego Citizens for Patients Rights. AD 78 - San Diego - Democrat Todd Gloria has been a staunch supporter of medical marijuana on the San Diego City Council and is endorsed by local patient advocates. SD 11 San Francisco - The race to fill Sen. Mark Leno's empty big shoes features two avowed supporters of marijuana: Supervisor Jane Kim, who stepped up to defend the city's cannabis clubs against federal attack, and Sup. Scott Weiner, who has been vigorously courting the pro-cannabis vote. SD 15 - San Jose - Incumbent Sen. Jim Beall has been a thoughtful supporter of medical marijuana as well as a leader on alcohol abuse issues. He faces a challenge from fellow Democrat Asm. Nora Campos, who has been reluctant to embrace marijuana and drug reform measures. SD 25 -La Canada - Voters face a disheartening choice in the race to replace termed-out Sen. Carol Liu. Democratic ex-Asm. Anthony Portantino voted against key reform bills in the Assembly, while Republican LA Supervisor Mike Antonovich, who is endorsed by the LA Police Chiefs, led the charge to ban dispensaries in the county. SD 35 - Compton - Two Democratic former Assembly members are facing off for this seat: Steven Bradford had a consistent pro-reform voting record, while Warren Furutani ducked out on tough votes. Berkeley - In the mayoral race, councilmember Jesse Arreguin has been a leading supporter of legal access to marijuana, as has his colleague Kriss Worthington. They are running allied campaigns, calling on supporters to mark them 1 and 2 in the city's ranked-choice voting. District 5 incumbent Steve Kearney faces a tough fight over other issues, but supported the county's ordinance to license and regulate marijuana grows. He is opposed by Clyde Clapp and David Tunno, who oppose marijuana; former Sacramento NORML activist Bob Bowerman, who supports it, and Bruce Guidici, who opposes a ban but wants limits on marijuana growing. District 1 incumbent Cliff Edson also supported regulation; his opponent, Gary Tofanelli, has been critical of the rules but hasn't taken a position on what to do next. Fremont - Planning commissioner Raj Salwan, who is running for city council, deserves credit for going to bat against Fremont's ban on medical marijuana. Hayward - The Brownie Mary Democratic Club of Alameda county has endorsed Al Mendall and Matt McGrath. Both said they would support dispensaries in Hayward. Nevada County - Board of Supervisors, District 2: Richard Harris, a vocal opponent of the county’s Measure W ban on outdoor growing, is seeking to unseat incumbent Ed Scofield, who supported Measure W.
San Diego Co. Board of Supervisors, District 3: Incumbent Dave Roberts (D) has been the only vote on the board not openly hostile to medical marijuana; his opponent, Kristin Gaspar, is an outspoken prohibitionist. Ventura County- Supervisor candidate Carla Castillo, district director for Sen. Hannah Beth-Jackson, supports common-sense local regulation of marijuana. Her opponent, Kelly Long, advised county residents to drive to LA instead. Avalon - Measure X would permit up to two medical marijuana dispensaries, and permit the delivery, cultivation, manufacture and processing of medical marijuana products, subject to a $10,000 annual license tax and a 12% transaction fee/tax on each individual medical marijuana sale. FAILED 36-64%. Butte County - Measure L would permit commercial cannabis cultivation, distribution, manufacturing and transporatation in most zones, while prohibiting outdoor cultivation in residential zones and establishing an exemption for personal cultivation of up to 100 square feet, and collective cultivation of up to 500 square feet. Read more. FAILED 42.5-57.5%. Calaveras County - Measure C would impose a $2/square foot commercial cannabis tax on outdoor/mixed light cultivation until the state establishes a track and trace program, at which point the tax will be $45/pound of dry weight trim and $10 per pound of dry weight trim; and $5/sq ft. on indoor culivation until a track-and-trace program is implemented, at which time the tax will be $70/lb. of bud and $15/lb. of trim; and a 7% on gross proceeds from manufacturing or retail medicinal or legal cannabis. Would require legal water source and compliance with regulations issued by the Water Quality Control Board, Fish and Wildlife, etc. PASSED 67-33%. Measure D would license and zone for commercial indoor, outdoor, and mixed light cultivation, plus nurseries and personal use/caregiver grows. FAILED 46-54%. Cathedral City - Cathedral City voters will consider Measure P asking if they want to expand the tax to all legal cannabis businesses at a rate of “$25 per square foot of cultivation space, and $1 for every gram of cannabis concentrate and every unit of cannabis-infused product," in order to fund municipal services including police and fire services and the library. Read more. PASSED76-24%. Coachella - Coachella's Measure II proposes a maximum 6 percent tax on a business' gross receipts and $15 per square foot of cultivation and manufacturing space every quarter. If retail spaces are approved in the future, they would be subject to a gross receipts tax and could bring in millions more to the city. Read more. PASSED 81.5-18.5%. Costa Mesa - Measure V would allow up to eight shops FAILED 35-65%. Measure W would allow for four. FAILED 39-60%. Both were the result of signature-gathering campaigns. Measure X, placed on the ballot by the city council, would allow testing labs and sites for making marijuana-infused products, but no shops. PASSED 53-47%. Del Rey Oaks (Monterey county) - Measure A would impose a tax of no more than 10% (5% when enacted) on gross receipts of cannabis businesses. PASSED 80-20%. Dunsmuir- Measure Y asks whether or not medical marjuana cultivation should be permitted in the city. FAILED 34-66%. Fillmore (Ventura county) - Fillmore's Measure H would tax commercial cultivation as much as $30/sq. ft. for the first 3000 sq. ft and $15 thereafter PASSED59-41%. Measure I would also tax retail transactions up to 15%. Read more. PASSED 64-36%. Humboldt County - Measure S will tax cultivation at $1 per sq. ft. for outdoor, $2 for mixed light and $3 for indoor. PASSED 70-30%. King City (Monterey Co) - Measure J would tax medical and nonmedical marijuana businesses at $25.00 per square foot for the first 5,000 square feet and $10.00 per square foot thereafter for cultivation; not to exceed $5.00 per square foot for nurseries; $30,000.00 each for manufacturing and testing facilities. The city council has already approved licencing for marijuana businesses. PASSED 80-20%. Lake County - Measure C asks, “Shall an annual general purpose tax be imposed on legally-authorized cannabis cultivation, with an exemption for personal medicinal use, occurring in unincorporated areas of the County of Lake of $1.00 per square foot of an outdoor cultivation site, $2.00 per square foot of a mixed-light cultivation site, and $3.00 per square foot of an indoor cultivation site, subject to annual Consumer Price Index increases, and generating annual revenue of approximately $8 million per average year?” PASSED 62-38%. Long Beach - Two competing measures will be on the ballot. Current tax rates are 6-10% of gross receipts, $15-$50 per square foot for cultivation, and $10 per square foot on all business improvements. The petition-driven Measure MM would bring those down to 6% of gross receipts and $10 per square foot (medical and recreational). FAILED with 59% of vote. The City's proposal, Measure MA, would establish tax rates for medical dispensaries of 6-8% of gross receipts, and 8-12% for recreational stores. Processing, Distributing, Transporting, or Testing facilities would pay 6-8% of gross receipts and cultivation facilities (medical and recreational) $12-$15 per square foot. PASSED 68-32%. Measure MA got more of the vote, overriding MM and so taking effect 10 days after the election. Marysville - Measure F would enact a cannabis business tax which will start at 5 percent and is capped at 15 percent, plus a $15 per square foot of canopy space cultivation tax with a cap of $25. Read more. PASSED 62.5-37.5%. Monterey County - Measure Y - would tax commercial marijuana businesses in the unincorporated area of Monterey County only (not cities) up to a maximum of: $25 per square foot on cultivation; $5 per square foot on nurseries ; and 10% of gross receipts on other marijuana business activities. PASSED 74-26%. Rio Dell (Humboldt Co) - Measure T asks, "Should the City of Rio Dell, by the necessary and appropriate action, permit commercial cannabis business activity, including cannabis cultivation, testing, processing and sales, within the area of the City that is located to the north of the Eel River and commonly referred to as the Sawmill Annexation Area if that activity is subject to local taxation?" PASSED 56-44%. San Bernardino (city) - Three competing ballot measures would allow for dispensaries in the city. Measure O would establish an application fee of $250 and annual fees of $5/square foot of cultivation, $5/sq foot of occupied business or manufacture space, and $100 per transport vehicle. Measure O also self-servingly designates certain parcels for legal licensing. PASSED 54-46%. Measure P, prepared by the city in consultation with cannabis advocates, would give the City Council more direct control over marijuana businesses if residents allow for them. FAILED 47.4-52.6%. San Jacinto (Riverside Co) - The city council put Measure AA on the ballot taxing gross receipts of marijuana businesses at 15%, and enacting a $50/square foot cultivation tax. PASSED 66.4-33.6%. Santa Cruz County - Voters will consider Measure E to extend their 7% tax to cultivators and others. Read more. PASSED 80-20%. Santa Cruz City - Measure I - Cannabis Business Tax PASSED 85-15%. Sierra County Measure B would specifically outlaw commercial cultivation. FAILED 42-58%.